At the present time there is no cure for many of the above. However, there are a number of specialized lenses now available that will allow post-surgical patients to function on a much higher level with a much greater level of comfort. While there are a number of soft lens and gas permeable lens designs included in the “specialized lens” category, I have come to rely on two major lens designs to address the vision and comfort issues that most post-refractive surgical patients are facing. These lens designs are the new Synergeyes Post-Surgical Lens and Post-Surgical Scleral Lenses. Synergeyes Post-Surgical Lenses are “hybrid” lenses. This lens consists of a highly oxygen permeable central area “married” to a soft periphery. The geometry of the lens is designed to fit over the irregular cornea without irritating the compromised corneal tissue. The soft peripheral portion of the lens gives superior comfort while at the same time creating a stable fit. Unlike previous hybrid lenses, the interface or juncture where the soft and rigid portions meet is extremely resistant to tearing or damage. In addition, the Synergeyes Post-Surgical lens is hundreds of times more oxygen permeable than it’s predecessors. Scleral lenses are large gas permeable lenses which vault over the compromised cornea and rest on the white portion of the eye (the sclera). Comfort and vision are extremely good. A special liquid fills the space between the back surface of the lens and the front of the cornea. 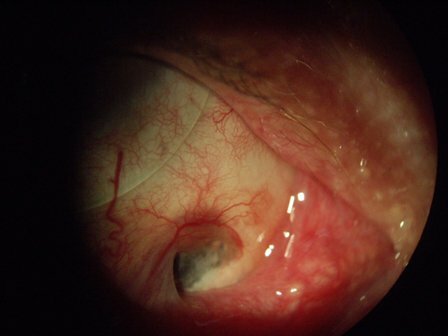 This type of lens, when fit correctly, very often allows the dried cornea to heal. Often, traumatized corneal tissues don’t heal due to the blinking action of the eyelids and various irritants in the environment (air conditioning, dust, allergens etc.). Scleral lenses protect the compromised corneal tissue allowing the eye to heal while providing vision that no other type of lens can provide.